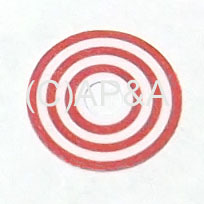 Self-adhesive decal for round standup (stationary) targets as used on many Williams electronic solid-state (SS) games 1977-1985. Will fit most other makes/models as well. Features red and white bullseye design. Install over the worn-away paint on your original targets for a fresh, new appearance! Decals feature protective Mylar covering on the front to help protect against wear and ensure long life. Each decal measures 1 inch in diameter, and has center punched out to fit over rivet in center of original target. Sold individually.